CEO & Co-Founder of Carbon3D and CLIP, a new 3D printing machine, Joseph DeSimone and his colleagues constructed. The printer was first inspired by the film Terminator 2 and specifically the T-1000 that could regenerate into any form, from a puddle of melted material. 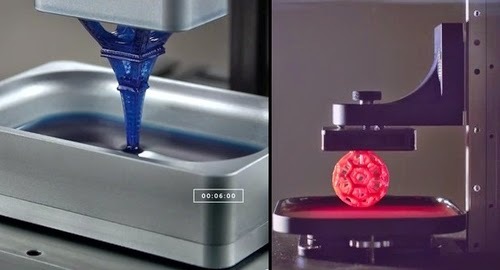 This technology has substantial improvements on the typical 3D printing tech out there, 1st, it is 25 to 100 times faster (DeSimone is confident it could reach 1000 times faster as the printer is refined). 2nd smooth no more ridges on the finished sculpture, like on the ones that we see now. This system uses a combination of three main components UV light, Oxygen and Resin (more in the video below). We have included 3 videos on examples of what can be built at this stage, the fourth one is a ten minute speech where DeSimone explains the beautiful elegance in which his machine works.